2016 Smart Brabus Forfour review | What Car? If you fancy a city car with a bit more get up and go, the Smart Brabus Forfour could be one to add to your shopping list. 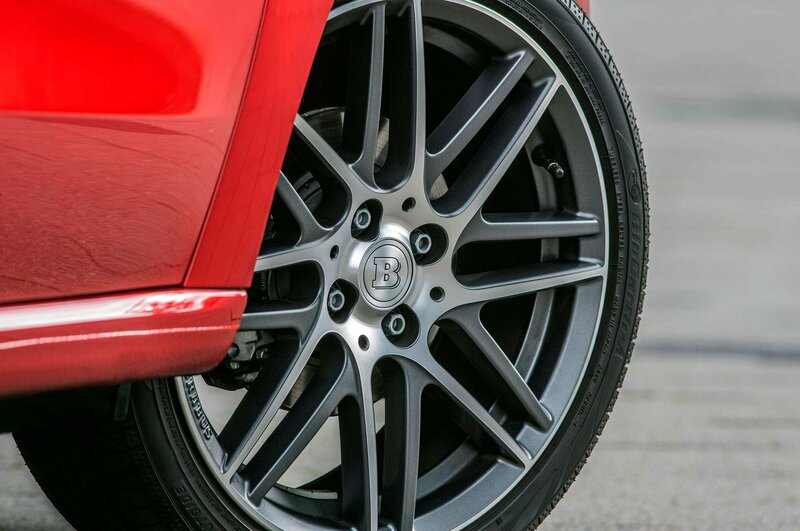 Brabus is a tuning firm that has close ties with Mercedes-Benz, owner of the Smart brand. Unlike Smart’s tiny Fortwo model, the Forfour has four seats instead of two, so presents a slightly larger footprint, but still feels small enough to work well in crowded city streets. So what’s different about this Brabus-tuned version? Well, the little 0.9-litre turbocharged three-cylinder engine has a bit more power than the quickest standard version – 107bhp instead of the 89bhp – acceleration is better. It also has stiffer, lowered suspension to sharpen the handling, as well as tweaks to the steering and the stability control, aimed at making it more fun to drive. We expect the Brabus Forfour to cost around £17,000 when deliveries begin this October. For that money you'll get a six-speed dual-clutch automatic gearbox, 17in alloy wheels and a panoramic roof. Whether it will come with air-con and sat-nav as standard isn’t absolutely clear, because the UK equipment levels have yet to be decided. 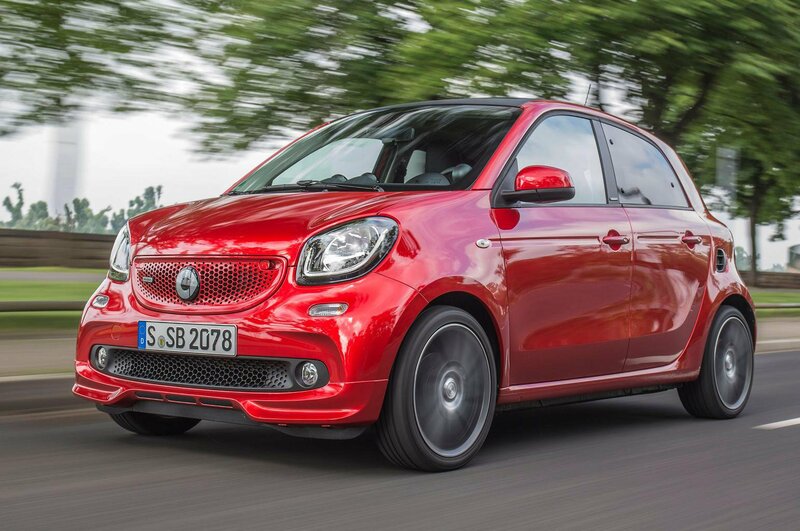 What’s the 2016 Smart Brabus Forfour like to drive? The little triple-cylinder engine is a touch lumpy at idle, but as soon as you are on the move it smoothes out and sounds pretty sweet. A sports exhaust comes as standard, but it doesn’t add much excitement to the engine’s note, other than a bit more thrum at idle or when you lift off the accelerator while driving along. With a 0-62mph time of 10.5sec, the pace is spritely rather than hot-hatch fast, but there’s enough go to whisk you up to a 70mph cruise with comparative ease. When you get there, however, there’s a considerable amount of wind noise from the doors and the roof. It has a slightly spikey power delivery, which makes driving smoothly quite a task. There’s not much shove below 2000rpm, and there's a momentary pause before the engine suddenly picks up and off you go, whichever speed you're travelling at. This isn’t helped by the way the auto gearbox works. If you are running in stop-start traffic the ‘box can be a little clunky at times, although once you hit freer-moving roads it changes gears relatively slickly, if not particularly speedily. Although the suspension is now stiffer, it hasn’t significantly harmed the Forfour’s ride. That said, compared with a VW Up the standard models don’t ride super smoothly, which means you still feel the Brabus pogo-ing up and down over rippled surfaces, while sharper ridges or deep potholes send a thud through the car’s body, and yours. The Brabus is sharper to drive than the standard Forfours, but again, nothing like as crisp through bends as an Up. You get lots of body lean on twisty roads if you drive with any gusto, and the steering, while quite accurate, has virtually no progressive weight build-up as you apply lock. This means you get very little sense of what the front wheels are up to. Mind you, it is light at parking speeds, and the tight turning circle allows easy U-turns. 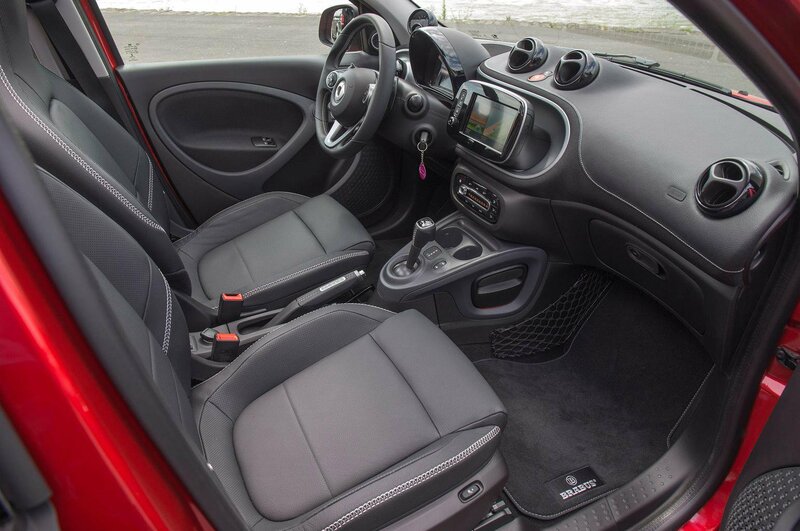 What’s the 2016 Smart Brabus Forfour like inside? The steering wheel moves only for height and not reach, but as you don’t need to stretch too far to hold it, this isn’t a big problem. Otherwise the driving position is pretty good. There’s plenty of room for two tall adults in the front and the driver gets a height-adjustable seat, but things are a little less appealing in the rear. That’s largely down to reduced head room - because of the panoramic glass roof - so anyone of above average height will almost certainly have their head wedged in to the roof lining. Rear leg room is tight, but that’s what you’d expect in this class, and getting in and out the back through the small rear-door opening is a palaver for the long-legged. At least it has rear doors, which make it more practical than the two-door Fiat 500 Arbath, and there are clever touches such as flip-up rear-seat squabs that help improve the load-carrying capacity. These are jolly useful, as by definition city cars are small, and the ForFour’s boot is only average by class standards, with room for about three large shopping bags. 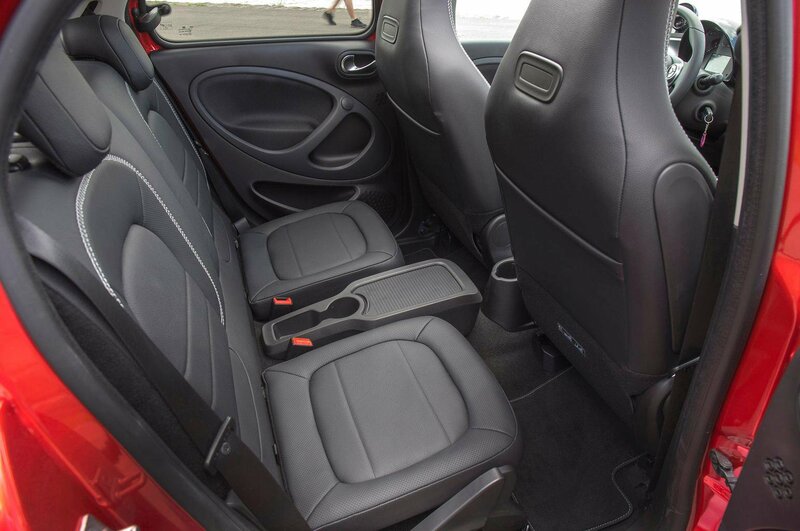 Generally we think the Brabus Forfour’s cabin scores well for quality and design. It feels much less drab inside than many of its rivals, and if you go for the optional Brabus Xclusive trim, you get leather sports seats and faux leather trim on the dashboard to lend it a properly premium feel. While the standard Forfour has some merits, we can’t see the value of going for this Brabus version; not when it’ll likely cost more money than a decently quick and fun small car such as the Mini Cooper. 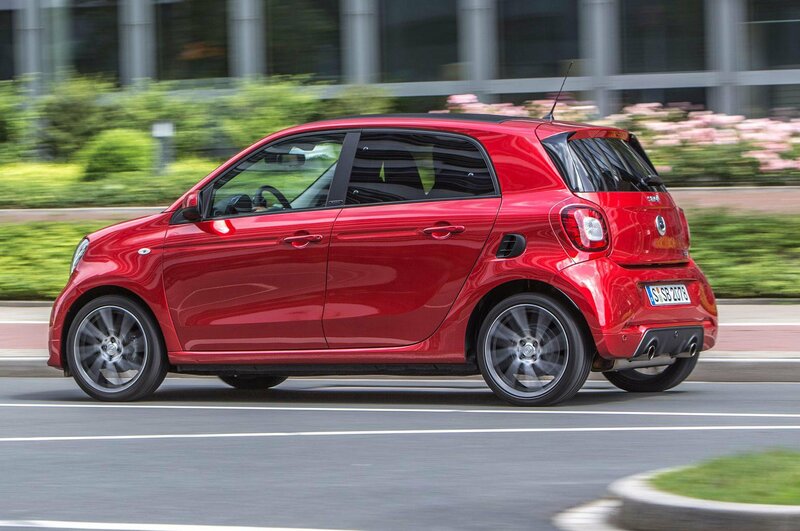 If that’s too big and all you want is a fun-handling city car, then look at the VW Up, Seat Mii and Skoda Citigo, all of which are better to drive than the Brabus Forfour, and cost a whole heap of cash less.